His Royal Highness, Prince Sultan Bin Abdulaziz became a member of the Saudi Council of Ministers after being appointed Agricultural Minister in 1953. This was at the time the Council of Ministers was initially formed. 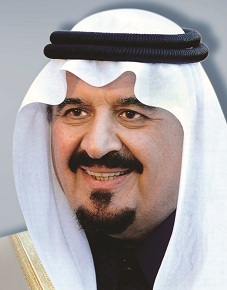 While serving as Agricultural Minister, Prince Sultan Bin Abdulaziz participated in the Bedouin settlement efforts and helped them to establish modern farms. In the year 1955, His Royal Highness Prince Sultan Bin Abdulaziz was appointed Communications Minister. While serving in this capacity, he participated in the installation of Saudi Arabia's modern surface communications networks and the countries wireless network. Then, in 1962, he was appointed Minister of Defense and Aviation. By royal decree, His Royal Highness Prince Sultan Bin Abdulaziz became the Second Deputy Prime Minister on 13 June 1982. His Royal Highness Prince Sultan Bin Abdulaziz was chosen to be Crown Prince and Deputy Prime Minister on 1 August 2005. His Royal Highness Prince Sultan Bin Abdualaziz was extremely active in environmental matters and in promoting sustainability. In 1981, he established the Saudi Presidency of Meteorology and the Environment as part of the Ministry of Defense and Aviation. He was the Chairman of Saudi Arabia's National Commission for Wildlife Conservation and Development (NCWCD), an organization which he founded in 1986 to promote the protection of the nation's indigenous wildlife. from 1990, he was the Chairman of the Saudi Ministerial Committee for the Environment, which sets forth the Saudi National Strategy for environmental protection. He supported the activities of Prince Sultan Research Center for Environment, Water and Desert at King Saud University including the Space Image Atlas of the Kingdom of Saudi Arabia. He also supported a number of King Saud University's research projects related to water and the environment, including the King Fahd Project for Rainwater Harvesting and Runoff in the Kingdom of Saudi Arabia. His Royal Highness Price Sultan Bin Abdualaziz was the patron of the International Conference on Water Resources and Arid Environments (ICWRAE) for its first 4 conferences from 2004-2010. In 1996, His Royal Highness Prince Sultan Bin Abdualaziz was awarded the Arab Environment Shield. In 2003 The Euro-Arab Cooperation Center, headquartered in Munich, conferred upon him the Peace and Environment Prize. He also received a number of local and international honors for his work in environmental protection and natural resource conservation. His Royal Highness Prince Khaled bin Sultan Bin Abdulaziz is the eldest son of Prince Sultan Bin Abdulaziz. Prince Khaled bin Sultan was formerly Saudi Arabia's Assistant Minister of Defense and Aviation. Prince Khaled bin Sultan spent twenty-five years in the armed services of his country. In 1986 he was appointed Commander of the Royal Saudi Air Defense Forces. In the Gulf War of 1990-1991, Prince Khaled was the Commander of Joint Forces and Theater of Operations. His Royal Highness Prince Khaled bin Sultan has always had a love of the natural environment and especially the oceans. His passion to contribute to ocean research and conservation matured with his experiences as an accomplished scuba diver. Saudi Arabia has access to some of the most beautiful coral reefs in the world along its long border with the Red Sea and Prince Khaled has personally witnessed the rapid deterioration of the world's coral reefs due to human activity. Throughout the late 1990's, His Royal Highness Prince Khaled bin Sultan hosted numerous international oceanographers aboard his ships to conduct cutting-edge research focused on understanding and preserving life in the ocean or to derive medical benefits from it. His yacht fleet, which includes the yacht Golden Odyssey, and the support vessel Golden Shadow, are frequently employed in major scientific research expeditions. After seeing firsthand the incredible work being performed by these scientists and understanding the magnitude of the challenge and importance of the work, Prince Khaled, in 2000, incorporated the Khaled bin Sultan Living Oceans Foundation in the United States to advance his vision of Science Without Borders. His Royal Highness Prince Khaled Bin Sultan was awarded the Seakeeper Award in 2000. As part of his "Science without Borders" initiative, Prince Khalid Bin Sultan launced on 10 October 2008 the three-year "Global Reef Expedition" to study shallow coral reef environments around the world beginning in 2010. "Our goal is to join the efforts of countries in different parts of the globe to conserve, and hopefully restore their coral reefs and other marine resources. The studies will include widespread mapping of endangered coral reefs by joint teams of world renowned experts -- as an essential first step towards their management and protection," HRH Prince Khaled said. He is also the founder of the Prince Khaled Bin Sultan Chair for Water Research at King Saud University which was inaugurated in 2009 with the aim of applying scientific research to combat water shortages. Dr. Abdulmalek Al Alshaikh was born in Riyadh in the year 1949. Ph.D. in Arid Lands Studies, 1983. University of Arizona, Tucson. Masters Degree in Agricultural Science, 1975. University of Arizona, Tempe. Bachelors Degree in Agriculture, 1972. University of Arizona, Tempe. 2008 –Chairman of the Prince Sultan bin Abdulaziz Chair for water research. The Prize Council, headed by His Royal Highness Prince Khaled Bin Sultan Bin Abdulaziz, holds regular meetings around the world. During each two-year round of the Prize, the Council convenes four general sessions. Two of these take place in Riyadh, where the Prize is headquarted. A third meeting is held in another Arab country and a fourth is held in a non-Arab country where international water experts and officials are invited to attend and participate. The purpose for holding Prize Council meetings abroad is to encourage the exchange of ideas and to open channels of cooperation among water specialists. Past meetings have been held in Cairo, Singapore, Paris, Dubai, Delft (The Netherlands), and Amman.